Add Parisian glamour to your existing bathtub alcove with the 60 in. x 60 in. 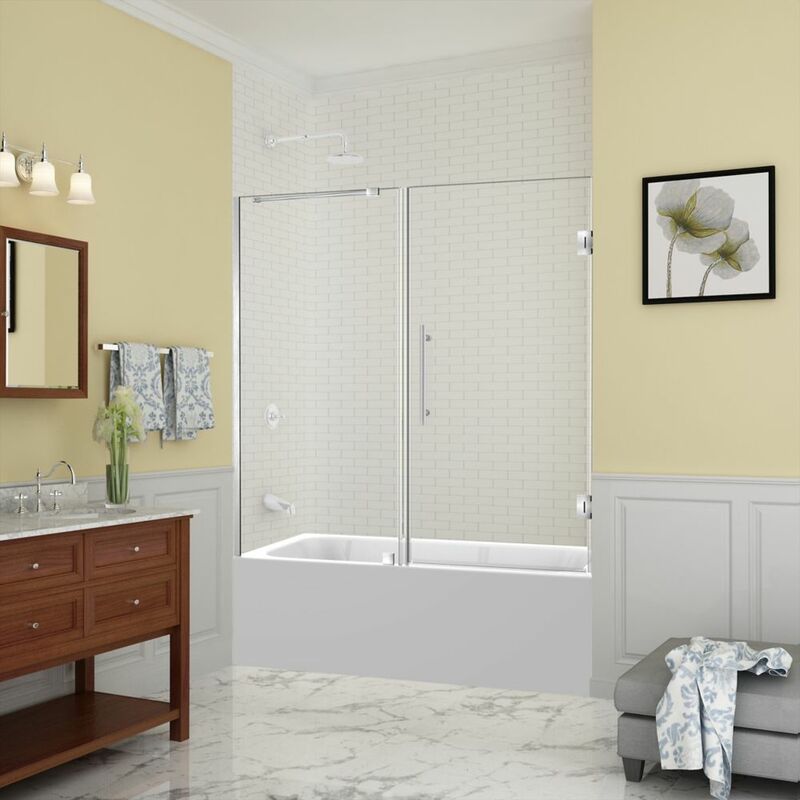 Vienne French-Style Frameless Sliding Tub-Height Shower Door. Its matte black 2-wheeled easy gliding-motion hardware and bold Blockpress mullion design creates a comforting yet sophisticated environment within your shower alcove. This sliding tub door's design is highlighted by its thick, premium 3/8 in. (10mm) tempered clear glass with professionally applied interior StarCast glass coating that ensures lasting clarity, stain protection and easy low-maintenance care and it can be installed left or right handed. This rustic-chic, luxurious tub door comes ready to install, and is available for either right or left hand installation. The DreamLine Aqua Lux is a frameless tub screen with European appeal and modern architectural design. With a stunning curved silhouette that creates an open, inviting feel, the Aqua Lux will transform your bathroom with elegant style to match its functionality. Belmore 59.25 inch to 60.25 inch x 60 inch Frameless Hinged Tub Door in Stainless Steel is rated 4.9 out of 5 by 36.